The purified flavonol, catechin has a modulatory effect on different cell cycle deregulations induced by benzene in AML model. The term “chemoprevention” is based on the concepts of multifocal field carcinogenesis and multistep carcinogenesis., A chemopreventive agent should be able to interfere with one or more phases of this multistep carcinogenesis process. It must also be safe, nontoxic, and effective when administered in long-term therapeutic use. In carcinogenesis, normal cells undergo transformation acquiring specific characteristics enabling the development of full malignancy. The loss of functions of cellular repairing system that otherwise repair DNA damage and ensure correct chromosomal segregation during mitosis enables populations of premalignant cells to develop the characteristic hallmarks of cancer cells. These principles represent prime targets for chemoprevention. Chemoprevention activity is often the result of amalgamation of several divergent intracellular dealings, as opposed to a single biological retort., Some of the more important mechanisms are (1) antioxidant activity, (2) anti-inflammatory activity, and (3) induction of apoptosis through monitoring cell cycle progression at various points. Flavonoids are ubiquitous groups of polyphenolic substances present in most medicinal plants. It can block the initiation or reverse the promotion stage of multistep carcinogenesis. The bark of Saraca asoca (SA) (Roxb. ), one of the best used medicinal plants, has a stimulating effect on the endometrial and ovarian tissue and has a beneficial effect on uterine fibroids., The bark of SA has also been used as a chemopreventive agent in the (7,12 dimethyl benz [a] anthracene) DMBA-induced skin cancer models. The presence of high amount of flavonoids in the methanolic bark extract of SA instigated us for the experimentation on the pharmacological implications of these compounds  and to test the bioactivity of the flavonoids as a chemopreventive agent using a benzene-exposed secondary acute myeloid leukemia (AML) model. SA bark was harvested during the month of mid-February to mid-March from herbal garden, Department of Botany, University of Kalyani, Kalyani. The voucher specimens (PDG/Bot./OB. 36, leaves of OB and PDG/Bot./SA. 42, bark of SA) were deposited and preserved in the Department of Botany, University of Kalyani, West Bengal, India, for reference. The primary antibodies specific for cyclin D1, cyclin E, CDK2, CDK4, CDK6, p21, p53, and b-actin and the secondary antibodies were purchased from Santa Cruz Biotechnology, Inc., (Santa Cruz, CA, USA). Six to eight-week-old Swiss albino male mice (Mus musculus) of maintained strain were purchased from a reputed breeder and were housed in a stainless steel wire cages (Tarsons, India) and maintained on a 12 h light–dark cycle. Pellet diet (West Bengal Dairy and Poultry Development Corp. Ltd., Kalyani, West Bengal, India) was provided ad libitum except 6 h daily period of benzene inhalation. Water was supplied automatically throughout the study. The in vivo model for the study of AML was developed according to the method of Saha et al. and Akbay et al., Benzene (MERCK, India) vapor was generated by heating liquid benzene to 16°C and channeled into the inhalation chamber. The groups of experimental mice were exposed 300 ppm, benzene for 6 h/day, 5 days/week for 2 weeks in 1.3 m 3 inhalation chambers (S.B. Equipments, West Bengal, India. ), MERCK, India, and the control group was exposed to ambient air for the same time frame. Benzene concentration in the chamber was monitored at regular half an hour interval. The temperature and humidity in the chambers were automatically maintained at 24°C ± 1°C and 55% ±10%, respectively. Plant extract was prepared according to the method described earlier. Pieces of bark were air-dried at room temperature until complete drying. They were kept away from direct sunlight to avoid destruction of active compounds. The bark pieces were pounded to powder using metallic motor and pestle. Ten grams of dried crude SA bark powder was used for Soxhlet extraction. Plant material was defatted by petroleum ether before extraction in methanol. Methanol was evaporated from the extract using vacuum evaporator under reduced pressure. Concentrated extract was stored at 4°C in air-tight bottle. The extraction yield was 12% (W/W). Total flavonoids content in the bark methanolic extract was determined by aluminum chloride colorimetric method. Quercetin solutions (5–100 μg) were used to build up the calibration curve., A calibration curve was made by measuring the absorbance of quercetin at different concentrations at 415 nm with a spectrophotometer. Concentration of total flavonoids of all plant extracts was calculated by interpolating the X-axis. Total flavonoid content (TFC for 100 g dried plant material) was calculated using the following formula. TFC = R × D.F × V × 100/W (When R = Result obtained from the standard curve, D.F. is Dilution factor, V is Volume of stock Solution, and W is Weight of plant used in the experiment). 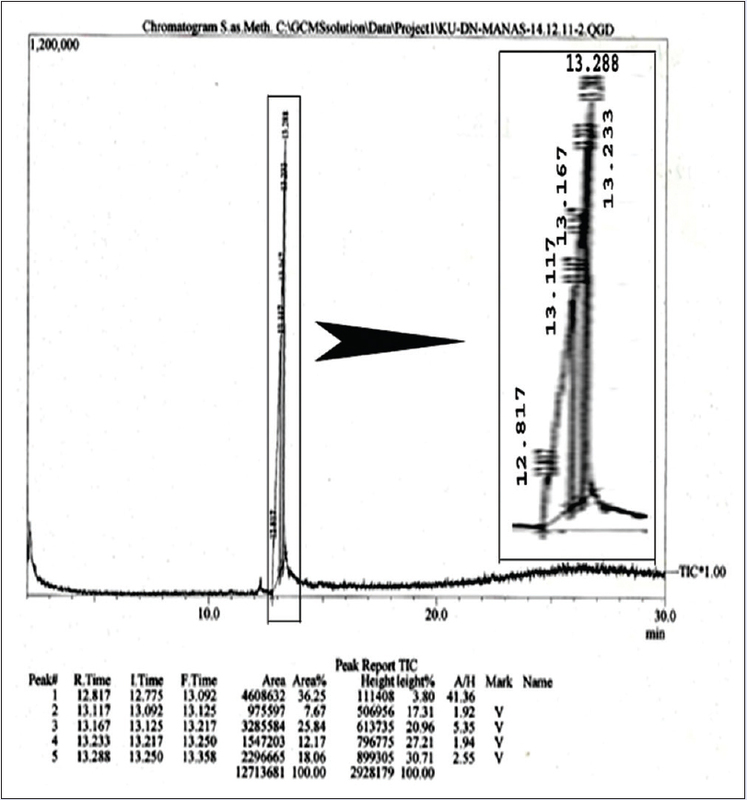 The gas chromatography–mass spectrometry (GC-MS) analysis of the extracts was performed using a GC-MS (QP 2010 series, Shimadzu, Tokyo, Japan) attached with a ZV 5 silica capillary column (30 m in length, 0.25 mm in diameter, and 0.25 μm of film). For GC-MS detection, an electron ionization system with ionization energy of 70 eV was used. Helium gas (99.99%) was used as carrier gas at a flow rate of 1.51 ml/min injector and mass transfer temperature was set at 200°C and 240°C, respectively. The oven temperature was programed from 70°C to 250°C at 10°C/min held isothermal for 1 min and finally raised to 300°C at 10°C/min. Two microliters of the diluted samples was manually injected in the split, with split ratio of 1:40 and mass scan of 50–600 amu. Total running time of GC-MS was 30 min. The relative percentage of the extract constituents was expressed as a percentage with peak area normalization. The identity of the compounds in the extract was assigned by the comparison of their retention indices and mass spectra fragmentation patterns with those stored on the computer library and also with published literature. NIST08.LIB, WILEY8.LIB library sources were used for matching the identified components from the plant material. The total crude methanolic extract of SA bark was evaporated in vacuum to yield a residue (130 g) that was then suspended in water (1 L) and successively partitioned with ethyl acetate (1 L × 3 times) and n-butanol (1 L × 3 times), yielding EA, BuOH, and water dissolved fractions. Each fraction was evaporated on a rotary evaporator to remove organic solvent and then lyophilized until dry. The yields of the EA, BuOH, and water fractions were 12.1, 13.2, and 79.0%, respectively, of the total crude extract in dry weight. The aqueous fraction was chromatographed over a RP-18 silica gel column (Cosmosil 75C18-OPN) and thin-layer chromatography (TLC) analysis of plant extracts was performed on RP-18 F254S TLC aluminum sheets (Merck), with compounds visualized by spraying with 10% (v/v) H2 SO4. Each spots on TLC plate were cut mechanically, collected, and stored in amber-colored vessel separately until further purified. The collected material was dissolved in methanol and filtered through Whatman no. 1 filter paper. Filtrate was then evaporated to dryness and weighed. Each residue was then tested for preliminary chemical nature. Spot 4 was identified as flavonoid. The yellowish brown material (YBM) from spot 4 was further run through RP-18 silica gel column, and the collected YBM (20 mg) was analyzed for H 1 and C 13 NMR (BRUKER 600 mHz) spectrum. The YBM from TLC was evaluated for their toxicity in male Swiss albino mice aged 6–8 weeks and weighing 22–28 g. According to Saha et al., the test of toxicity of the YBM, 30 mice were randomly divided into three groups of ten animals (five males and five females) per cage. Before oral administration, the mice were fasted for 1 to 2 h. Then, the extract was dissolved in distilled water and administered daily by oral gavage to the mice of Groups B and C. The control group (Group A) received a respective volume of distilled water (vehicle) for 29 days. The mice in Group B were given orally the YBM at a dose of 50 mg/kg, and the mice in Group C were given the extract at a dose of 1500 mg/kg of body weight. The mice were then observed continuously for 1 h after the treatment, intermittently for 4 h, and for 29 days. The mice were observed for gross behavioral changes, condition of coat, discharge, movement, body weight changes, serum biochemistry, hematological parameters, and mortality for 30 days to test subacute toxicity. From the result of toxicity study of YBM, it was found that the plant extract is nontoxic. Hence, the benzene exposed group of mice was treated with the YBM at a dose of 50 mg/kg body weight orally from the date of commencement of benzene exposure for 4 weeks daily. Control group of mice was treated with the respective volume of distilled water. After completion of the treatment with plant extract, the animals were kept in fasting overnight and sacrificed after 30 days by decapitation and blood was collected. Blood hemoglobin concentration (g %) was determined using Sahil's hemoglobinometer, and total white blood cell (WBC) and red blood cell (RBC) were counted using Neuber's hemocytometer. Other blood parameters included platelet numbers, differential count of monocyte, lymphocyte, neutrophil, and different RBC indices such as hematocrit, mean corpuscular volume, mean corpuscular hemoglobin, and mean corpuscular hemoglobin concentration were performed. The femur bone of the sacrificed experimental mice was dissected out, and both the proximal and distal ends of the bone were removed. Phosphate buffer (pH 7.2) was injected gently into one end of the shaft. This process was repeated to flush out the bone marrow through the opposite end into a collection vessel. Protein extracts of the bone marrow from four groups of experimental animals were prepared by sonication of bone marrow cells in a cell lysis buffer containing 20% sodium dodecyl sulfate (SDS), 2 mM phenyl methyl sulfonyl fluoride, and a protease inhibitor cocktail. Protein concentration of bone marrow extract was quantified using Bradford method. Protein extracts from bone marrow (15 μg for p21 and 10 μg for other) were denatured, subjected to 12% (W/V) SDS-polyacrylamide gel electrophoresis, and then transferred to polyvinylidene difluoride membranes. Nonspecific binding sites were blocked by incubating the membranes with 5% nonfat dried milk and 0.1% Tween 20 in Tris-buffered saline (TTBS, pH 7.4) for 1 h at room temperature; the membranes were incubated with diluted primary antibodies overnight at 4°C. The membranes were then washed with TTBS and incubated with 1:2000 horseradish peroxidase-conjugated secondary antibodies for 50 min at room temperature. 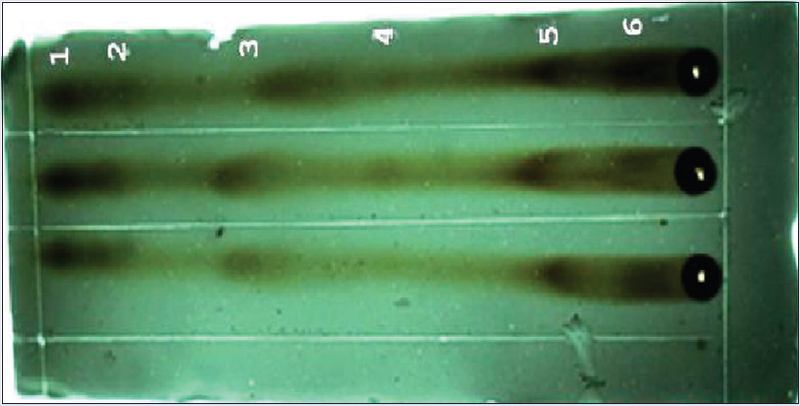 To detect the bands, the membranes were treated with a detection reagent, and band densities were measured using an image analyzer (ImageJ, NIH). DNA was extracted from bone marrow cells of four groups of animals using reagents and protocol suggested by Bangalore Genei (PI.NO: KT23). DNA concentration was measured at 260 nm using a spectrophotometer (Varian, Germany). DNA extracts were then subjected to 0.8% agarose gel electrophoresis using 1X TAE buffer as running buffer (composition: 40 mM Tris-acetate, 1 mM ethylenediaminetetraacetic acid [EDTA]), and ethidium bromide (Et Br) (final concentration into gel 0.5 μg/ml) as staining agent. Five microliters of 100 bp DNA ladder was loaded into one well in each assay. 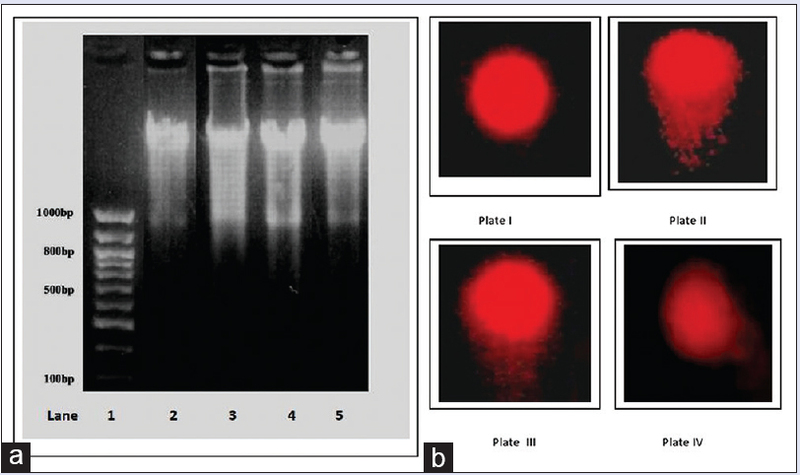 The gel was visualized and photographed using a gel documentation system (Genei™ image system). The method of Singh et al. was followed with minor modification. The lymphocyte cells were isolated from blood of four groups of mice using reagents and protocol provided by HiSep LSM (Hi Media, Germany). The cells were suspended in 110 μl of low melting point agarose (0.65% LMPA – W/V in phosphate-buffered saline [PBS], pH = 7.4) and smeared on a frosted glass microscope slide precoated with 140 ml of 1% normal melting point agarose (in PBS, pH 7.4). The agarose was allowed to set for 10 min at 4°C and thereafter the coverslip was removed. The slides were exposed to lysis solution overnight (2.5M NaCl; 0.1M Na2 HPO4; 10 mM Tris-Cl; 0.3M NaOH; 1% Triton X100; 10% dimethyl sulfoxide pH 10). The solution was kept at 4 C for 1 h before use. On next day, slides were transferred into a horizontal electrophoresis chamber containing electrophoresis buffer (300 mM NaOH, 1 mM Na2-EDTA; pH 13.0) and presoaked for 20 min to unwind DNA. Electrophoresis was carried out for 20 min (30 mA, 20 V). Slides were then washed thoroughly with neutralizing buffer (Tris 0.4M, pH 7.5), stained with Et Br (final concentration of 40 μg/ml), and examined under a Leica fluorescence microscope. The DNA breakage percentage was determined by measuring the COMET tail length using the software Motic Image China. The protocol used in this study was approved by the Animal Ethical Committee of University of Kalyani (under Committee for the Purpose of Control and Supervision of Experiments on Animals). The two-tailed Student's t-test was done to determine the significance of differences between benzene-exposed and plant leaf extract-treated group to control group. Significance level was considered at P < 0.05 level. The analysis of total flavonoid using quercetin as standard flavonoid (y = 0.0003x + 0.07, R2 = 0.969) of methanolic bark extract shows average flavonoids content is 28% throughout the year. In the GC-MS analysis [Figure 1] and [Table 1], five bioactive phytochemical compounds were identified in the methanolic bark extract of SA. The identification of phytochemical compounds is based on the peak area, molecular weight, and molecular formula. Catechin (C15H14O6) with retention time (RT) 12.817 has peak area 36.25%, 2,5-ditritylpyrrole 1H-pyrrole, 2,5-bis (triphenyl methyl)-(67370-39-2) (C42H33N) with RT 13.117 has peak area 7.76%, procyanidin B2 (C30H26O12) with RT 13.167 ranks next having peak area 25.84%. 2H-Pyran-2-one, tetrahydro-4-hydroxy-6-pentyl-(36555-25-6) with RT 13.233 ranks with peak area 12.17% and n-Decanoic acid (C10H20O2) has RT 13.288 with peak area 18.06% with minor compounds. The TLC profile study of the aqueous fraction of the methanolic extract of the bark of SA with details has been described in [Table 2] and [Figure 2]. Rf values  for different spots were calculated accordingly. 1H NMR: 6.741 (6, 1H, dd, J = 8.499, J = 1.047), 7.001 (7, 1H, dd, J = 8.499, J = 2.585), 6.103 (8, 1H, d, J = 0.000), 6.722 (9, 1H, dd, J = 2.585, J = 1.047), 6.103 (10, 1H, d, J = 0.000), 2.737 (11, 1H, dd, J = 15.632, J = 1.520), 2.744 (11, 1H, dd, J = 15.632, J = 4.780), 4.181 (20, 1H, ddd, J = 4.780, J = 1.920, J = 1.520), 5.003 (21, 1H, d, J = 1.920). Comparing all these spectral data with that stored in library using the software program MestReNova, the closely matched flavonol compound was catechin. Physicochemical observations were recorded to determine potential toxic effects of infused plant material in the animals. No adverse effects such as behavioral changes, coat conditions' alterations, discharge, and movement abnormality were seen for both Group B and Group C animals. No mice were found to be died during the study and no significant changes of body weight, serum biochemical parameters, and hematological parameters [Table 3] were due to normal growth of the animals. Hence, the selected dose of plant extract is nontoxic. Expression of key cell cycle regulatory proteins [Figure 3] such as p53 and p21 has been reduced in benzene-induced hematotoxicity in mice (Lane 2). Based on our results, we hypothesized that the plant extract might have modulatory effects on cell cycle regulation. As evident from [Figure 3], level of caspase 11 has been upregulated in benzene-exposed group and downregulated in catechin-treated (Group III) as well as in doxorubicin-treated group (Group IV) compared to the control group of animal. 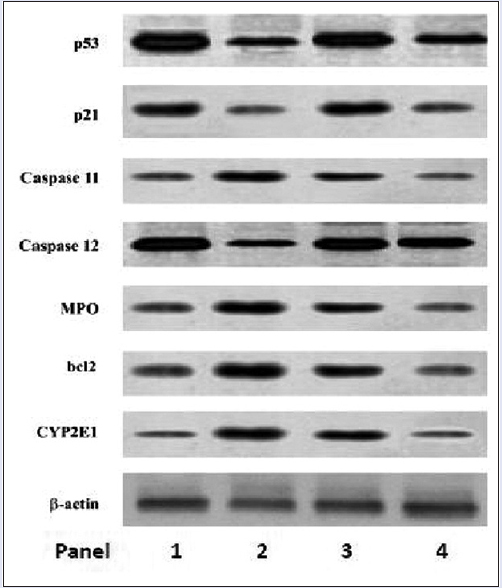 Myeloperoxidase (MPO), bcl2, and CYP2EI follow a similar trend as indicated by panel 2, 3, and 4 in the adjoining figure. In case of caspase 12, the level is lowered in benzene-exposed animals, and increased expression of this protein was found in another two groups. Treatment of both YBM from SA and doxorubicin resulted in the significant upregulation of the level of p21 and p53 in benzene-exposed mice compared with nontreated benzene-exposed mice. 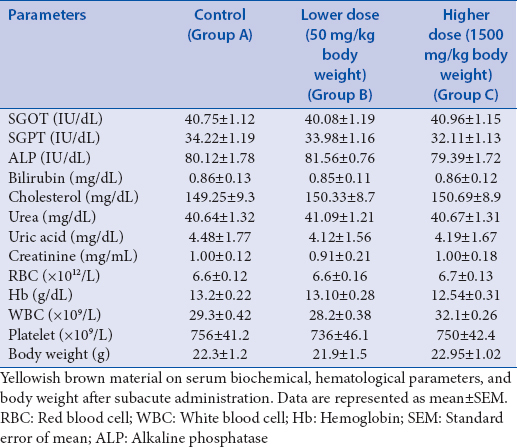 The results shown in [Table 4] indicate that number of RBC, WBC, and Hb (g%) has been decreased in benzene-exposed group compared to control group of animals. Hb (g%), RBC, and WBC have been decreased to 9.86 ± 1.6, 2.11 ± 0.19, and 3.28 ± 0.45, respectively [Table 4]. After treatment of benzene-exposed mice with the YBM, the above parameters increase significantly (P < 0.05) and the value reaches to 11.23 ± 1.01, 2.91 ± 0.18, and 6.21 ± 0.27, respectively, whereas after treatment with doxorubicin, the values reach to 10.21 ± 0.97, 2.23 ± 0.16, and 5.87 ± 0.35, respectively. This result is also in accordance with overexpression of p21 in YBM (Group III) and doxorubicin-treated (Group IV) group of animals as shown in immunoblot analysis [Figure 3]. In total WBC count, number of lymphocytes increases significantly (P < 0.05) after treatment with the YBM as well as doxorubicin. Hct as RBC index also increased significantly (P < 0.05) in both the groups after treatment [Table 5]. The bone marrow cellularity showed the same pattern of changes as showed by Mukhopadhyay and Nath  in benzene-exposed model. The gross cellularity was changed toward the control system after treatment with catechin as well as doxorubicin (data not shown). As shown in [Figure 5], benzene-exposed (Group II) animals survive for a period of 12.5 ± 1.2 weeks. Due to the treatment of the benzene-exposed animals with the YBM from SA and doxorubicin, mean survival time of the animal increases to 15.5 ± 1.4 and 16.3 ± 1.5 weeks, respectively. Benzene vapor induces inflammatory responses, oxidative stress, alterations in cell cycle progression, and DNA damage in mice. All these changes have been associated with the development of various blood diseases including AML., Hence, benzene-exposed animal model , can act as a significant template for the study of secondary cancers with respect to different parameters measuring clinical manifestations. Among many other dietary chemicals, the flavonoids are major components of fruits and vegetables. This is known that flavonoids have antimutagenic activity. Quercetin was shown to inhibit the mutagenic activity of benzo[a] pyrene (BP), a representative polycyclic aromatic hydrocarbons carcinogen, in studies of bacterial mutagenicity. It was also shown to inhibit BP-induced nuclear damage in colonic epithelial cells of mice. The investigators also found that most of 13 other studied flavonoids were anticlastogenic when administered orally before and after intraperitoneal exposure to BP. It was also noteworthy that several hydroxylated flavonoids were found to inhibit mutagenic activity of bay-region diol-epoxides (putative ultimate mutagens/carcinogens) of BP. Catechin is a flavan-3-ol, a type of natural phenol and antioxidant. It is a plant secondary metabolite. It belongs to the group of flavan-3-ols (or simply flavanols), part of the chemical family of flavonoids. Catechin, epicatechin, quercetin, and resveratrol, which account for more than 70% of polyphenolic compounds in red wine, were shown to inhibit the growth of human breast cancer cells at picomolar concentrations. The same compounds were also shown to potentially inhibit human prostate cancer cells., The tea polyphenols, (2)-epicatechin gallate, and epigallocatechin gallate inhibited the adhesion of mouse lung carcinoma 3 LL cells to the monola. In the case of flavonoids of SA bark, GC-MS study [Figure 1] and [Table 1] showed the presence of catechin with RT 12.817 having peak area 36.25%. TLC [Figure 2] and [Table 2] and NMR analysis showed that the 4th spot of YBM is closely related to flavonol compound “Catechin.” As shown in [Figure 3], Catechin treatment in benzene-exposed mice resulted in the upregulation of p53 and p21 and control over the cell cycle deregulation. MPO is an enzyme that is expressed in neutrophil granulocytes. Simultaneous exposure of the benzene-induced AML animal to the bark flavonol enhanced the expression of MPO which was downregulated in the Group II animals showing a reduced level of immunodeficiency. Caspase 11 and 12 are closely associated with the pro-apoptotic signals  and once activated they cleave and activate the downstream effector caspases such as 3, 6, and 9. Exposure to benzene was observed to cause the expression of lower level of both caspase 11 and 12, but significant upregulation of caspase 12 was observed without any significant effect on expression of caspase 11. Overexpression of bcl2, a well-known anti-apoptotic protein, was found in the control animal AML model in contrast with catechin-treated animal where expression of bcl2 indicated the prevention of deregulation of the cellular cycles that proceed to the development of cancer. This event is also supported by the lowering of expression of CYP2E1, a member of cytochrome p450 mixed oxidation system related to the xenobiotic metabolism  [Figure 3]. Doxorubicin-treated secondary AML animal model showed the same profile of recovery in the deregulated cell cycle progression in cancer cases. 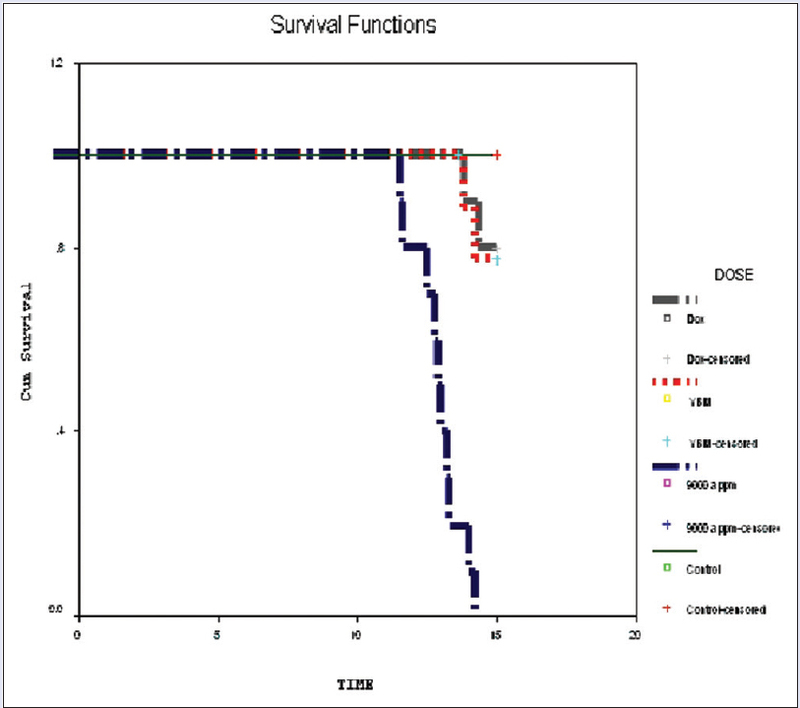 This study was supported by the observation that YBM, like doxorubicin, can act as the neutralizer and protector of mortality in cancer cases [Figure 5]. Analysis of blood parameters is relevant to risk evaluation as the hematological system has a higher predictive value for toxicity in humans (91%) when assay involve rodents and nonrodents., Blood is an important index of physiological and pathological status in man and animals and the parameters usually measured are hemoglobin, total RBC, and leukocyte (WBC) counts. The hematotoxicity of benzene is characterized by suppression of erythromyelopoiesis, resulting in the depression of leukocyte (lymphocyte count mainly) and erythrocyte levels in peripheral blood., This result is also in accordance with overexpression of p21 as shown in immunoblot analysis [Figure 3]. 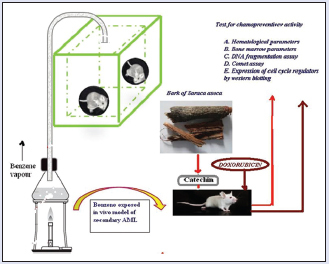 However, after treatment with bark catechin, it was found that it can be preventive in control of blood cell number if peripheral circulation in benzene-exposed AML mouse (T) supported by the observation of chemoprevention of DNA damage [Figure 4]a. This analysis is supported by the comet assay test showing declined DNA damage in the bone marrow cells [Figure 4]b. In conclusion, protection by plant secondary metabolites is currently an important strategy for controlling the process of various diseases including hematotoxicity. Therefore, there is a need to explore medicinal plants or other natural agents that can work as protective agents against hematotoxicity. In the present work, our results show the significant activity of purified catechin from SA bark against benzene-induced hematotoxicity in mice. On the basis of above evidences, it is possible that catechin present in the extract may be responsible for the chemopreventive activity in mice. However, this claim demands extensive studies on synergistic pharmacodynamic interactions of the phytochemicals as well as the effects on signal modulation which are essential for the development of multiactive natural drugs from SA for cancer chemoprevention in the near future. It is also hoped that tailored supplementation with designer foods that consists of chemopreventive phytochemicals – each having their own distinct anticancer mechanisms – will be available in the near future. These should be developed in line with advances in the genetic and molecular epidemiology of carcinogenesis. Our data suggest that catechin from methanolic bark extract of SA effectively attenuate benzene-induced secondary AML in bone marrow, which is likely associated with the anticell cycle deregulation properties of this flavan-3-ol. This study was supported by the observation that catechin (YBM), like doxorubicin, can act as the neutralizer and protector of mortality in cancer cases. The work was financially supported by University Of Kalyani, Kalyani Nadia West Bengal. Sporn MB. Approaches to prevention of epithelial cancer during the preneoplastic period. Cancer Res 1976;36 (7 PT 2):2699-702. Sporn MB, Suh N. Chemoprevention: an essential approach to controlling cancer. Nat Rev Cancer 2002;2:537-43. Scott EN, Gescher AJ, Steward WP, Brown K. Development of dietary phytochemical chemopreventive agents: biomarkers and choice of dose for early clinical trials. Cancer Prev Res (Phila) 2009;2:525-30. Milner JA. Nutrition and cancer: essential elements for a roadmap. Cancer Lett 2008;269:189-98. Surh YJ. Cancer chemoprevention with dietary phytochemicals. Nat Rev Cancer 2003;3:768-80. Hirsch FR, Merrick DT, Franklin WA. Role of biomarkers for early detection of lung cancer and chemoprevention. Eur Respir J 2002;19:1151-8. Tsao AS, Kim ES, Hong WK. Chemoprevention of cancer. CA Cancer J Clin 2004;54:150-80. Lin JK, Tsai SH. Chemoprevention of cancer and cardiovascular disease by resveratrol. Proc Natl Sci Counc Repub China B 1999;23:99-106. Zelnak AB, O'Regan RM. Chemoprevention of breast cancer. Curr Probl Cancer 2004;28:201-17. Fisher B, Costantino JP, Wickerham DL, Cecchini RS, Cronin WM, Robidoux A, et al. Tamoxifen for the prevention of breast cancer: current status of the National Surgical Adjuvant Breast and Bowel Project P-1 study. J Natl Cancer Inst 2005;97:1652-62. Cummings SR, Eckert S, Krueger KA, Grady D, Powles TJ, Cauley JA, et al. The effect of raloxifene on risk of breast cancer in postmenopausal women: results from the MORE randomized trial. Multiple outcomes of raloxifene evaluation. JAMA 1999;281:2189-97. Wattenberg LW. Inhibition of neoplasia by minor dietary constituents. Cancer Res 1983;43 5 Suppl: 2448s-53s. Omenn GS, Goodman G, Grizzle J, Thornquist M, Rosenstock L, Barnhart S, et al. CARET, the beta-carotene and retinol efficacy trial to prevent lung cancer in asbestos-exposed workers and in smokers. Anticancer Drugs 1991;2:79-86. Hennekens CH, Buring JE, Manson JE, Stampfer M, Rosner B, Cook NR, et al . Is secondary leukemia an independent poor prognostic factor in acute myeloid leukemia? Best Pract Res Clin Haematol 2007;20:29-37. Smith-Warner SA, Genuncer J, Giovannucci E. Fruit and vegetable consumption and cancer. In: Heber D, Blackburn GL, Go VL, editors. Nutritional Oncology. Vol. 153. San Diego: Academic Press; 1999. Wu X, Patterson S, Hawk E. Chemoprevention – History and general principles. Best Pract Res Clin Gastroenterol 2011;25:445-59. Kale A, Gawande S, Kotwal S. Cancer phytotherapeutics: role for flavonoids at the cellular level. Phytother Res 2008;22:567-77. Ghosh S, Majumder M, Majumder S, Ganguly NK, Chatterjee BP. Saracin: A lectin from Saraca indica seed integument induces apoptosis in human T-lymphocytes. Arch Biochem Biophys 1999;371:163-8. Satyavati GV, Prasad DN, Sen SP, Das PK. Further studies on the uterine activity of Saraca indica Linn. Indian J Med Res 1970;58:947-60. Varghese CD, Nair SC, Panikkar B, Panikkar KR. Effect of asoka on the intracellular glutathione levels and skin tumour promotion in mice. Cancer Lett 1993;69:45-50. Mukhopadhyay MK, Nath D. Phytochemical screening and toxicity study of Saraca asoca bark methanolic extract. Int J Phytomed 2011;3:498-505. Smith MT. The mechanism of benzene-induced leukemia: a hypothesis and speculations on the causes of leukemia. Environ Health Perspect 1996;104 Suppl 6:1219-25. Larson RA. Is secondary leukemia an independent poor prognostic factor in acute myeloid leukemia? Best Pract Res Clin Haematol 2007;20:29-37. Mukhopadhyay MK, Nath D. Physiologically based toxicokinetic modeling of secondary acute myelolytic leukemia. Environ Toxicol Pharmacol 2014;37:378-89. Saha S, Mukhopadhyay MK, Ghosh PD, Nath D. Effect of methanolic leaf extract of Ocimum basilicum L. on benzene-induced hematotoxicity in mice. Evid Based Complement Alternat Med 2012;2012:176385. Akbay P, Basaran AA, Undeger U, Basaran N.In vitro immunomodulatory activity of flavonoid glycosides from Urtica dioica L. Phytother Res 2003;17:34-7. Kaufman PB, Cseke LJ, Warber S, Duke JA, Brielmann HL. Natural Products from Plants. New York: CRC Press; 1999. p. 20-2. Borges-Argáez R, Peñia-Rodríguez LM, Waterman PG. Flavonoids from the stem bark of Lonchocarpus xuul. Phytochemistry 2000;54:611-4. Sharma V, Pandey D. Beneficial effects of Tinospora cordifolia on blood profiles in male mice exposed to lead. Toxicol Int 2010;17:8-11. Yoon BI, Hirabayashi Y, Kawasaki Y, Kodama Y, Kaneko T, Kim DY, et al. Mechanism of action of benzene toxicity: cell cycle suppression in hemopoietic progenitor cells (CFU-GM). Exp Hematol 2001;29:278-85. Zohra SA, Meriem B, Samira S, Muneer MS. Phytochemical screening and identification of some compounds from Mallow. J Nat Prod Plant Resour 2012;2:512-6. Aksoy M, Erdem S, DinCol G. Leukemia in shoe-workers exposed chronically to benzene. Blood 1974;44:837-41. Snyder CA, Goldstein BD, Sellakumar AR, Bromberg I, Laskin S, Albert RE. The inhalation toxicology of benzene: incidence of hematopoietic neoplasms and hematotoxicity in ARK/J and C57BL/6J mice. Toxicol Appl Pharmacol 1980;54:323-31. Ogawa S, Hirayama T, Nohara M, Tokuda M, Hirai K, Fukui S. The effect of quercetin on the mutagenicity of 2-acetylaminofluorene and benzo[alpha] pyrene in Salmonella typhimurium strains. Mutat Res 1985;142:103-7. Wargovich MJ, Eng VW, Newmark HL. Inhibition by plant phenols of benzo[a] pyrene-induced nuclear aberrations in mammalian intestinal cells: a rapid in vivo assessment method. Food Chem Toxicol 1985;23:47-9. Huang MT, Wood AW, Newmark HL, Sayer JM, Yagi H, Jerina DM, et al. Inhibition of the mutagenicity of bay-region diol-epoxides of polycyclic aromatic hydrocarbons by phenolic plant flavonoids. Carcinogenesis 1983;4:1631-7. Damianaki A, Bakogeorgou E, Kampa M, Notas G, Hatzoglou A, Panagiotou S, et al. Potent inhibitory action of red wine polyphenols on human breast cancer cells. J Cell Biochem 2000;78:429-41. Kampa M, Hatzoglou A, Notas G, Damianaki A, Bakogeorgou E, Gemetzi C, et al. Wine antioxidant polyphenols inhibit the proliferation of human prostate cancer cell lines. Nutr Cancer 2000;37:223-33. Kampa M, Suzuki Y, Satoh K, Narumi K, Motomiya M. Effects of catechins on the mouse lung carcinoma cell adhesion to the endothelial cells. Cell Biol Int 1993;7:559-64. Sakamaki K, Satou Y. Caspases: evolutionary aspects of their functions in vertebrates. J Fish Biol 2009;74:727-53. Ghanayem BI, Hoffler U. Investigation of xenobiotics metabolism, genotoxicity, and carcinogenicity using Cyp2e1(–/–) mice. Curr Drug Metab 2007;8:728-49. Olson H, Betton G, Robinson D, Thomas K, Monro A, Kolaja G, et al. Concordance of the toxicity of pharmaceuticals in humans and in animals. Regul Toxicol Pharmacol 2000;32:56-67. Schalm OW, Jain NC, Carroll EC. Veterinary Hematology. 3rd ed. USA: Lea and Febiger; 1975. Farris GM, Robinson SN, Gaido KW, Wong BA, Wong VA, Hahn WP, et al. Benzene-induced hematotoxicity and bone marrow compensation in B6C3F1 mice. Fundam Appl Toxicol 1997;36:119-29. Cronkite EP, Drew RT, Inoue T, Hirabayashi Y, Bullis JE. Hematotoxicity and carcinogenicity of inhaled benzene. Environ Health Perspect 1989;82:97-108.